Where mail was delivered and horses changed. 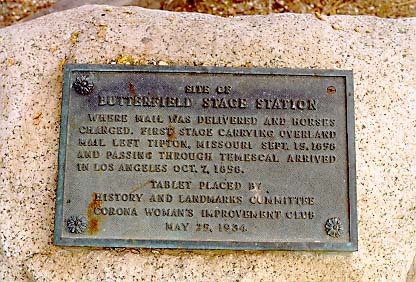 First stage carrying Overland Mail left Tipton, Missouri Sept. 15, 1858 and passing through Temescal arrived in Los Angeles Oct. 7, 1858. 20730 Temescal Canyon Rd, 7 mi S of Corona.